News > 2016 > Congratulations to our 3,073 new graduates! Congratulations to our 3,073 new graduates! On November 21 and 28, HEC Montréal saluted the achievements of 3,073 new certificate, bachelor’s, master’s and specialized graduate diploma (DESS) graduates, bringing the number of people trained in all fields of management at the School to 86,400 since it opened in 1907. 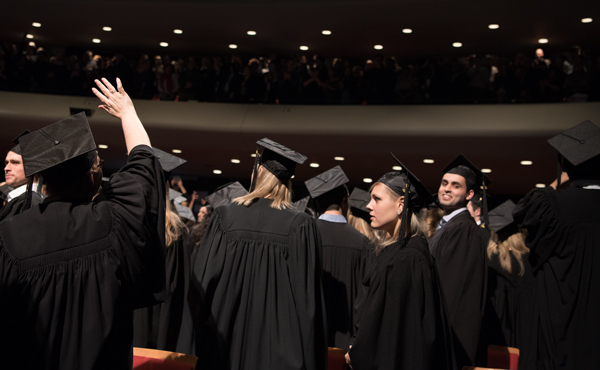 The undergraduate and graduate convocation ceremonies were both held in Théâtre Maisonneuve at Place des Arts, with Secretary General Federico Pasin acting as Master of Ceremonies, along with faculty members, program directors and a representative of the alumni association. The bachelor’s and certificate convocation ceremony on November 21 was attended by 490 graduates, and 355 graduates turned out for the master’s and DESS convocation ceremony on November 28. HEC Montréal Director Michel Patry and the Hélène Desmarais, Chair of the Board of Directors, also attended the November 28 ceremony. At the second event, Laurent Lapierre and Jacques Nantel were both appointed Professors Emeritus, in recognition of their exceptional contributions to research, teaching, and the development and renown of HEC Montréal.